MILAN — At the intersection of design and taste on one hand and craftsmanship and innovation on the other, Deséa Golden Touch by Gufram is an iconic new limited edition product by Lavazza and Gufram. These two historic brands, which have always been global ambassadors of Italian excellence in design and innovation, have brought an exclusive collaboration to life that creatively combines Lavazza’s expertise in the world of coffee with the artistic flair of Gufram. Deséa, the latest gem of Lavazza technology, has an original, premium design by Gufram, one that valorises the coffee machine’s elegant contours and the revolutionary experience created for a new generation of coffee and milk lovers. 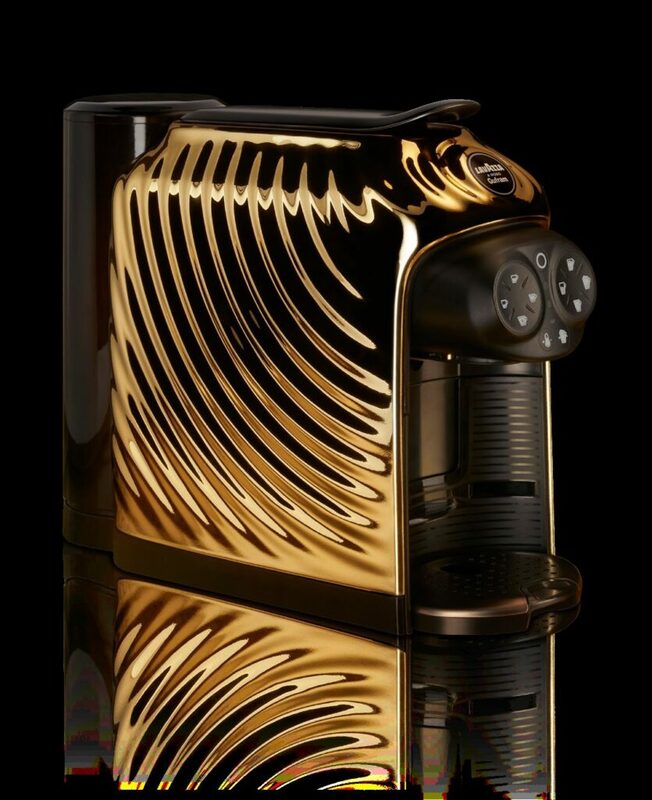 The brand, whose philosophy has always revolved around surreal and disruptive storytelling, has reinterpreted the new A Modo Mio domestic system coffee machine from an intelligently ironic and futuristic perspective, in which everything from the colour to the aesthetics is quite out of the ordinary for this category of product. Deséa Golden Touch by Gufram, available online from the Lavazza website, is a truly accessible luxury object, one that targets design enthusiasts in search of uniqueness and beauty to fill their everyday lives. The meeting of the two brands is celebrated by the Lavazza A Modo Gufram logo, which appears prominently on the Limited Edition coffee maker and seals a solid partnership. This graphical mark placed centrally on the front of the new domestic icon becomes the point of focus from which Gufram’s unconventional touch propagates, transforming the original surface of the casing into precious golden leather punctuated rhythmically by delicate waves. The original texture reprises a drop of coffee that from the first ripple spreads out gradually over the rear section, only to disappear where it meets the water, as represented by the machine’s tank. The theme of the Golden Touch chosen by Lavazza and Gufram celebrates the innovative technology One Touch Barista Interface, which offers a unique experience in its genre. The new limited edition coffee machine also provides a simple button to prepare various coffee- and milk-based drinks and satisfy the differing taste demands of advanced consumers. Gufram sublimates a complex dialogue between industry and art, and between design and spirit, with the creation of Deséa Golden Touch by Gufram, the first domestic sculpture by Lavazza. 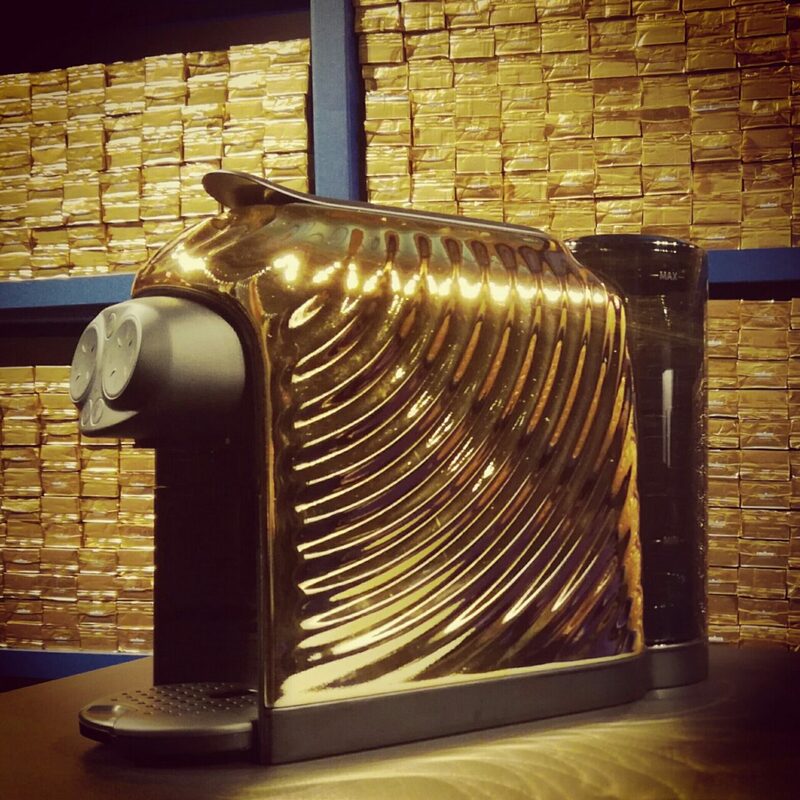 The Lavazza Deséa Golden Touch by Gufram will be available through the Lavazza site – landing page Salone del Mobile – for only one month after the Design week. Any interested person would be allowed to purchase only one item by following specific information criteria and instructions. Delivery time line is about 4 weeks, upon availability for Europe and Australia only.